This month’s featured story is Julie Silver, MD. I was introduced to Dr. Silver via her book, After Cancer Treatment, where I was moved by how spot on she is with her thoughts on and practice of cancer after care treatment. 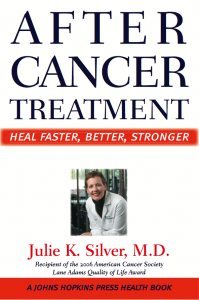 A breast cancer survivor and thriver, Julie is an accomplished doctor and writer. Her website http://juliesilvermd.com/books provides information on her books. We are honored to feature her story and share it with you. After my last chemotherapy appointment, I asked my oncologist, “What do I do now?” When he responded that I needed to go home and try to heal and return to work at some point if I could, I knew that there was a better way—cancer rehabilitation. I’m a rehab doctor, so I’ve spent my entire career helping people to heal as well as possible from serious injuries and illnesses. In 2009, 6 years after I was diagnosed with cancer, I developed the STAR Program (Survivorship Training and Rehabilitation[J1] ). The STAR Program® has been adopted by hospitals and cancer centers throughout the United States. There are more than 2,000 STAR Clinicians® and STAR Providers™ in the U.S. who are trained to help cancer survivors have the best quality of life possible, whether they are cured, in remission or living with cancer as a chronic condition. How do you hope to inspire others with your story? My goal is to make evidence-based cancer rehabilitation care available to all survivors. What is one thing you have learned about yourself by having breast cancer? How has breast cancer been a blessing in your life? I don’t believe that serious illness is a blessing, but I think it’s an opportunity to learn and to use the experience to help others. What advice would you give someone newly diagnosed with your type of breast cancer? My advice to people who are newly diagnosed is to focus on all of the survivors. I edited a book for the American Cancer Society called “What Helped Get Me Through: Cancer Survivors Share Wisdom and Hope”. It’s a wonderful collection of survivors’ stories with their wisdom about what really helped them. What breast cancer stress or worry wakes you up at 1 AM? I worry less now than I used to. What resource/s have been most beneficial to you on your path? There are many wonderful resources—online and in the community and in the hospitals and cancer centers throughout the U.S.
Any additional thoughts to share? Your health insurance will likely cover cancer rehabilitation services as long as they are provided by trained healthcare professionals like rehabilitation doctors (physiatrists) and physical, occupational and speech therapists. Ask your doctor for a referral.